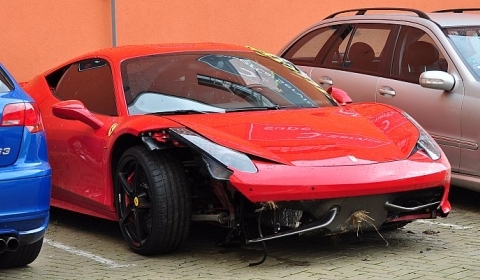 Another Ferrari 458 Italia has crashed in the Czech Republic. The prancing horse had less than 300km on the odometer. Only six hours after getting the car from dealer the owner parked the car in a ditch while overtaking on its way to Pardubice. The accident happened on the 11th of August. It is the 10th car in 91 days that has been crashed or has burned down. We are really wondering what Ferrari will do. Perhaps they are suggesting a recall?